Thermal fluctuations and hydrodynamics play an important role in investigations of soft materials and many biological systems. Many implicit solvent coarse-grained models have been developed and usefully applied for equilibrium studies. To perform dynamic studies requires taking into account contributions from the solvent degrees of freedom, such as hydrodynamic momentum transfer. 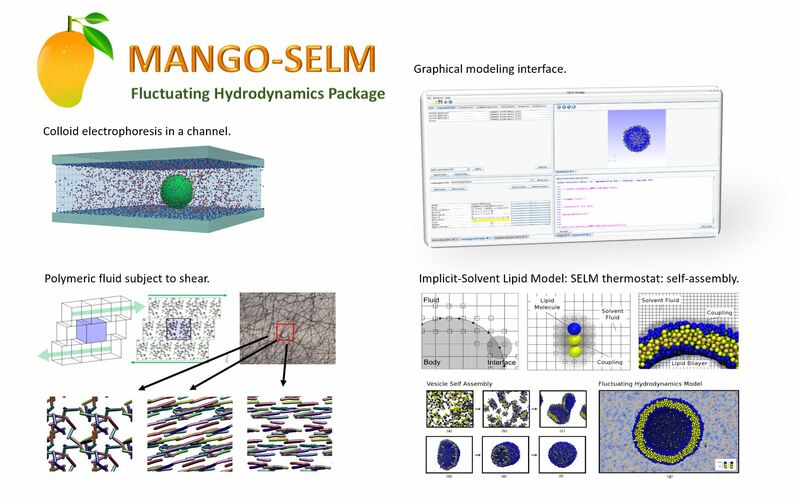 We have developed new approaches SIB and SELM that are based on fluctuating hydrodynamics to simulate efficiently hydrodynamics and thermal fluctuations. Numerical methods are available in the package USER-SELM for LAMMPS [downloads and additional information]. 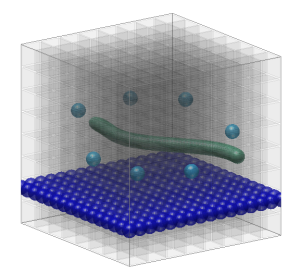 The Immersed Boundary Method (IB) is a widely used approach for computationally investigating fluid-structure interactions for point particles, filaments, and elastic sheets. For investigations of soft materials and many biological systems, thermal fluctuations play an important role. We have formulated new immersed boundary methods incorporating thermal fluctuations based on the theory of fluctuating hydrodynamics and principles from statistical mechanics. To obtain tractable numerical methods, we have developed integrators that cope with the wide range of dynamic time-scales present in these systems. We refer to these new approaches as Stochastic Immersed Boundary Methods (SIBs). Software for simulating such fluid-structure interactions using these new stochastic integrators can be obtained here [downloads and additional information].